Mohun Bagan share the spoils with Gokulam Kerala FC in a 2-2 draw! Home / Indian Football / I-League / Mohun Bagan share the spoils with Gokulam Kerala FC in a 2-2 draw! Mohun Bagan and Gokulam Kerala FC shared a point each post a thrilling 2-2 draw in Wednesday’s only game of the 12th I-League. The game that was being played at the Saltlake Stadium in Kolkata, saw the home side failing to secure a much-needed win post their loss in the Kolkata derby on Sunday. While the home side drew first blood through Shilton D’Silva in the 18th minute, their heroics were soon nullified thanks to an own goal in the 21st minute, due to a miscommunication between their defender Kim Kima and goalkeeper Shilton Paul. 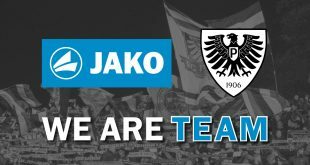 Their woes doubled up as Gokulam Kerala FC fired in a second through Marcus Joseph in the 24th minute to take a lead of 2-1. Mohun Bagan finally rescued them from a loss in the 60th minute when Dipanda Dicka scored the equaliser from a Henry Kisseka pass. Gokulam Kerala FC’s goalkeeper Arnab Das Sarma was adjudged the Hero of the Match. 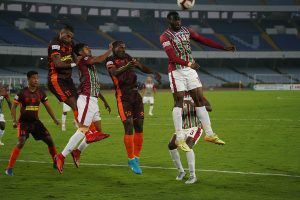 Mohun Bagan started the game in their traditional Maroon and Green while Gokulam Kerala FC in their home strip of Brown and Orange. Khalid Jamil made three changes to the playing XI that had lost the Kolkata derby to Quess East Bengal on Sunday. While Shilton D’Silva, Arijit Bagui and Azharuddin Mallick found their way in, Abhishek Ambekar, Pintu Mahata and Darren Caldeira were left out for today’s clash. Gokulam Kerala FC again hit back within a minute when Imran Khan struck again but missed the target. However, within the first 10 minutes of the game, the hosts had four to five opportunities to score but couldn’t, thanks to Gokulam Kerala FC’s careful and alert defenders and some good goalkeeping by their custodian Arnab Das. Mohun Bagan, after those two early scares, increased the pressure on Gokulam Kerala FC, attacking in short bursts and trying to draw first blood but were unable to break the defensive deadlock. Their efforts finally paid off when Shilton D’Silva headed in a beautiful corner kick from Sony Norde in the 18th minute to give the home side a hard-earned lead in the game. However, the celebrations did not last for long as just three minutes later, some poor communication between their goalkeeper Shilton Paul and defender Kim Kima led to an own goal from the latter, gifting Gokulam Kerala FC the equaliser. Mohun Bagan, who were rattled by their own errors, were found trailing by a goal and started attacking again but were unsuccessful in breaching through the rock-solid Gokulam Kerala FC defence. Their closest chance to an equaliser came in the final seconds of the regulation time of the first half when Kisseka missed a golden opportunity to score from the front of the Gokulam Kerala FC goal. The first half came to an end with the scoreline reading 1-2 in Gokulam Kerala FC’s favour. The game in the latter half saw a much more organised Mohun Bagan but their efforts were nullified thanks to an alert Gokulam Kerala FC defence. The match finally ended in a 2-2 draw with both Mohun Bagan and Gokulam Kerala FC sharing a point each. Previous Second season of Mizoram Futsal League official kicks off! Next VIDEO – Mumbai City FC: Islander Teammates ft. Souvik Chakrabarti!